Jon Bain-Chekal, a finance project manager in Berkeley’s controller’s office, and his husband, Mark Chekal-Bain, were on their way to a wedding in Michigan when their social worker called. “Can you cancel your plans?” she asked. A newborn had just been abandoned at a Pleasanton hospital — and Jon and Mark were waiting for a child to foster, and adopt. • Prohibits staff from using vacation or sick leave intermittently during an unpaid leave of absence in order to benefit from holiday pay and employer contributions to benefits that would otherwise not be provided. The updated policy applies to Professionals and Support Staff (PSS), Managers and Senior Professionals (PSS), and Senior Management Group (SMG) members. A PDF of the full Absence from Work policy can be found on UC’s At Your Service website. 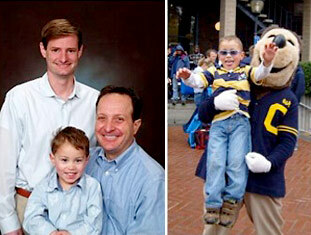 That call, in 2004, started the Bain-Chekals on the extraordinary journey that is parenthood. It also marked the launching point of the two fathers’ relentless quest to persuade the University of California to adopt a parental-leave policy for its unrepresented staff. Six years later, Wesley has just entered kindergarten. And UC began the fall semester with a new policy that allows staff — men and women, gay and straight — to use up to 30 days of their own sick leave to care for and bond with a newborn, adopted or foster child. The policy was announced by the Human Resources and Benefits office of the UC Office of the President after the end of spring semester. It was one of six adjustments made to the university’s leave policy for its staff (see sidebar for the full list). The parental-leave policy came about because of work by Bain-Chekal and allies on two chancellor’s advisory committees he serves on: the committee on dependent care, and the committee on the gay and lesbian community. He worked closely with Sharon Page-Medrich, assistant to the dean of the Graduate Division and another LGBT committee stalwart. Bain-Chekal remembers clearly what motivated him to persist in what proved to be an uphill effort. When he and Mark decided they wanted a child, he had checked to see if he could use his sick leave and vacation time for family leave, and was told that he could. That information was one factor that kept him from leaving Berkeley, where he’d earned his bachelor’s degree and MBA, for a job at Cisco. “I stayed at Cal because I wanted to have a family and I wanted parental leave to have a child,” he says. But then, when Wesley arrived and he asked to take three months off, the story had changed. He could use his vacation, but not his sick leave, he was told. Parental leave was a gray area at Berkeley, he learned, and whether staffers got to use sick leave or not was often up to their supervisor. He eventually was allowed to use his sick leave, as well as vacation, but heard from other employees that they weren’t so lucky. So he decided to try to do something about it — to get a clear policy that applied in the same way to everyone. Asked what it took to get the job done, Bain-Chekal pulls out a three-inch-thick folder stuffed with documentation. “And I cleaned it out recently, because we were done,” he adds. The federal Family and Medical Leave Act requires that employers allow time off for family reasons, but it doesn’t provide for payment. In California, the state disability program provides six weeks of paid time off for women giving birth, and six weeks of family leave for fathers and adoptive parents. But UC doesn’t participate in the state disability system — and in any case, state payments fall short of full pay. The university has traditionally handled pregnancy as a disability and granted disability leave to mothers giving birth, but not fathers or adoptive parents. Many corporations, however, have gotten out of the business of defining pregnancy as a disability and have moved to broader parental-leave policies, Bain-Chekal discovered. pregnant women differently?" L: The Bain-Chekal family — Jon, Mark and Wesley. R: Wesley gets a lift from Oski. A fairer alternative, he proposed, was to have a policy that covered all parents equally. He also pointed out that such a policy meant no new expense to the university — and would help Berkeley retain valued employees. Bain-Chekal started his campaign with Berkeley’s Human Resources office. Early on, he got the chancellor’s committees on the LGBT and disability communities involved, as well as the UC-wide LGBT leadership group. Berkeley Chancellor Robert Birgeneau provided Berkeley Initiative for Leadership and Diversity (BILD) funding for Bain-Chekal and Page-Medrich to work part-time on the issue for one year. Their efforts eventually focused on UCOP, which sets leave policy for all 10 campuses. There, Bain-Chekal had some inside help: Mark worked in external relations at UCOP during part of the effort, and was able to advocate in various ways. The effort ground along slowly. Proponents were told at one point that they needed to win approval from the Board of Regents, and spent several years rounding up votes. But then UCOP decided it could act on its own, according to Bain-Chekal. When action came, it was swift. UCOP put out a draft of its revised leave policy, and gave Bain-Chekal and Page-Medrich three days to respond — over a weekend. They wrote letters pointing out myriad issues and inconsistencies, and heard nothing more until June, when UCOP issued the new policy. “Now it’s official. The change in the policy that we wanted was one sentence,” Bain-Chekal observes. In the end, he contends that it will benefit Berkeley because the policy tells its employees the campus cares about them.